Using the GUI Server it's possible to generate rich dialog boxes with minimal coding effort. N.B. DogLua will automatically issue a GUI_OpenPanel() if a GUI_WaitOnEvent() is encountered and the dialog box isn't yet opened. N.B. DogLua will automatically close the dialog box when the script is finished, to avoid the possiblity of leaving dialogs floating around. Wait for a dialog event: a button clicked, a scroller moved, etc. It returns the index of the control that generated the event, and both a numeric and a string parameters with values depending on the control's type. The index will be equal to -1 or -2 if the [OK] or [CANCEL] button was pressed. Usually GUI_WaitOnEvent() is used in a repeat - until loop, eventualy executing some code on every iteration. Specify a title for the dialog. Can be used anywhere, before the dialog is displayed. Specify a bitmap to be showed on top of the dialog. Like the GUI_SetCaption() functon, it should be used before opening the dialog. If the file name doesn't contain any path info, the bitmap will be searched on the DogLuaScripts folder. Set how much space should be between controls. 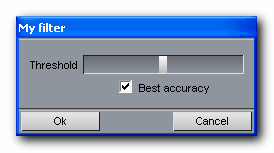 Used to retrive the settings / properties of a control. Should be used before closing the dialog. The only parameter needed is the control's index (obtained when the control was added). The function will always return both a numeric and a string parameters, with values depending on the control's type. Change the properties / settings of a control previously added to the dialog. The parameters to be supplied are the index of the control, a numeric value and a string value (with meaning depending on the control's type).